My first vine-ripened red one - but all the rest are green? ... funny thing is, I have dozens of tomatoes all over my plants, but none are red? This was the only red one. My question is, should I pick a few of my bigger tomatoes off and let them ripen in the kitchen, or should I let them sit on the vine? Some are monstrous! But I also want the plants to keep producing - will picking them cause the plant put production into new fruits? 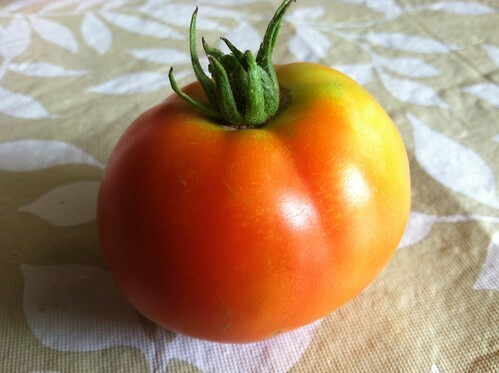 Once they start to blush, they can be picked and ripened inside. The one you picked, I think, could probably use a few more days to really ripen. I think the skin gets a satiny sheen and the surface gives a little when truly ripe. Don't worry -- the green ones will change color in their own time. Enjoy this one when you are ready to eat it! i agree with applestar... they will all turn on their own.. i have 9 different tomato plants.. and only 1 grape tomato has turned red so far. I would leave them be now myself. Give them time. Do leaf branches die below ripened clusters? Saving Seeds From "Paper Bag" Ripened Tomatoes?